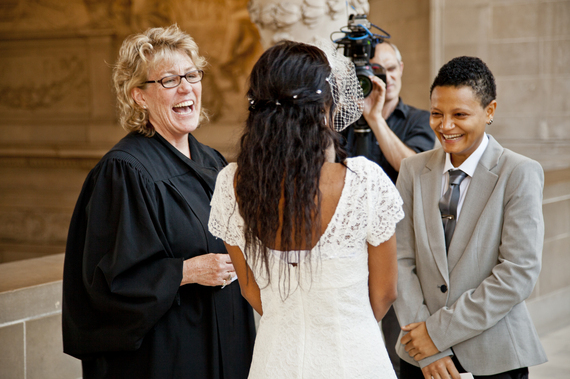 History was made Friday as a lesbian couple, seeking asylum in the United States, celebrated their marriage at San Francisco City Hall. After years of persecution in Angola, Mari and Cara, whose real names have been withheld to protect family members in Africa, made their way to the Bay Area, San Francisco, where they hope to receive asylum and start a new life, safely together. There was not a dry eye amongst the guests who witnessed the moving nuptials, as the couple exchanged vows under the coveted majestic arch window on the fourth floor of City Hall. The marriage was officiated by renowned LGBT activist Anne Kronenberg, a political administrator, well known for her work as Harvey Milk's campaign manager, who also posed for photos with the couple next to the famed Harvey Milk bust in the rotunda. Kronenberg, who offered her services after hearing the couple's story of courage and triumph, expressed: "It was an honor to be a part of this joyous day for these two beautiful young woman. The discrimination, hatred and homophobia they faced in their own country not only from society, but from their own families was unthinkable in this day and age. They now have the opportunity to live their lives together and to be true to themselves - to be who they are, two individuals who are in love. Cara and Mari no longer have to pretend to be something or someone else. Thank you for letting me take part in this glorious day. I have had a smile on my face since they each said "I do"." The celebration, followed by a reception in the Castro at Destino, sponsored by Michele Meow of KOFY TV, was attended by members of the LGBT community, two families from West Marin County who have provided host housing, a film crew led by director Tom Shepard, shooting a PBS documentary about asylum seekers and refugees from Africa, and members of the African Human Rights Coalition (AHRC) which has been providing advocacy and referral services to the couple. Asylum seekers cannot work for six months from the date of filing of the asylum application and so AHRC established a crowd source fund for the couple on Indiegogo. Members of the community have donated cash toward living expenses, as well as a wedding cake, rings, and the gorgeous outfits worn by the brides. Kimpton Hotels came forward with a generous show of support, providing a honeymoon package at the luxury Palomar Hotel, which included dinner at the fabulous restaurant, Dirty Habits. Speaking after the weekend the couple expressed their gratitude: "Our wedding was magical. It was a day we will never forget. Thank you to everyone who came to our special day and thank you to everyone who helped put our ceremony together." The women are receiving pro bono legal representation for their asylum application by attorneys from The Cooley Law Firm. Executive Director of African HRC, Melanie Nathan, expressed hope that the community would continue to contribute to the critical support needed: "Mari and Cara have lost everything - their home, their family, their country and livelihood. Their arrival in San Francisco, while life saving, is fraught with daunting challenges. We urge our community to come forward with donations, however small, and we also need more volunteers to offer host housing in the East Bay or San Francisco." LGBTI people are criminalized and suffer state sanctioned persecution in 38 African countries, a result of draconian Colonial Penal Codes, heightened anti-homosexuality laws, with dangerous homophobic provocation by American fundamentalist religious extremists. "There are few viable mechanisms in place to help targeted LGBT people into exile and no financial or housing resources available once they reach the U.S.A. It is a miracle that Mari and Cara made it here. I believe we have a duty to take care of members of our own community - we are their family and so I am hoping many more people will step forward to help," Nathan notes.